What Happened to Russell Pickering's Website Pentagonresearch.com? 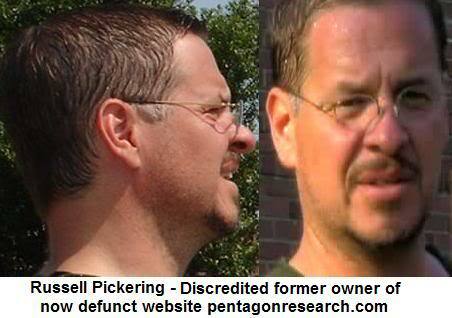 Russell Pickering was arguably the most well known 9/11 Pentagon event researcher for a few years prior to December 2007 when he dramatically "quit" the truth movement as documented here. He was the creator and owner of the now defunct website pentagonresearch.com that is cited numerous times in David Ray Griffin's book "Debunking 9/11 Debunking". An archive of his site from February 2007 can be found here (cached backup). Citizen Investigation Team (CIT) spent a few days with Russell in person during our very first research trip to Arlington, VA in late August 2006 while we were volunteering as research consultants to the 9/11 documentary "Loose Change Final Cut" by Dylan Avery. We respected some of Russell's work that he had already published at the time even if we disagreed with his conclusions. The relationship started out amicable but turned progressively ugly after we returned to Arlington a second time (without him and Dylan) in November of 2006 to obtain the witness interviews at the former Citgo proving that the plane flew north of the gas station and therefore did not hit the light poles or Pentagon. Russell had a reputation for being professional, logical, and even-tempered, but after we obtained this evidence he started emotionally spiraling out of control while desperately working to cast doubt on our findings with an aggressive campaign against us personally. Before we met Russell in person on our first research trip he had already proclaimed to us his belief that a large airplane hit the Pentagon. He suggested that it was not piloted by alleged hijacker Hani Hanjour as claimed by the government but that it was likely "remote controlled" into the building. He had no evidence to support this claim and merely asserted it as his unsubstantiated belief. Listen to audio here (1.81 mb). Download video here (28.5 mb). "My official statement now on the Pentagon is that something with a wingspan of greater than 100 feet but less than 140 hit the building. [...] If I were asked what my belief is, it is that a 757 hit the building..."
Notice how Russell does not cite anything new to explain what lifted the frustration he expressed in the video less than 30 days prior. His certainty in the official impact narrative only continued to grow as we proceeded to uncover overwhelming evidence proving otherwise. Instead of providing counter-evidence, he responded with steadily increased personal attacks against us, a reaction that discredits him as a logical 9/11 truth seeker. He was further discredited in August 2007 when he let it slip that he found out about the north side witness a day before we all visited the Citgo station together. This is explained and sourced here. This is significant because all of us (including Dylan) remembered that Russell first mentioned the witness after we arrived at the station. This means he withheld that information for a day until he knew we would likely find out about it ourselves and he felt he had no choice but to tell us. We were supposed to share all of our findings with each other as the trip progressed in order to keep each other honest, yet Russell withheld key information likely hoping that we would go home the next day without ever discovering it. Russell was well aware that a plane on the north side could not possibly have created the damage trail, obviously making this critical information that he should have immediately shared with us. 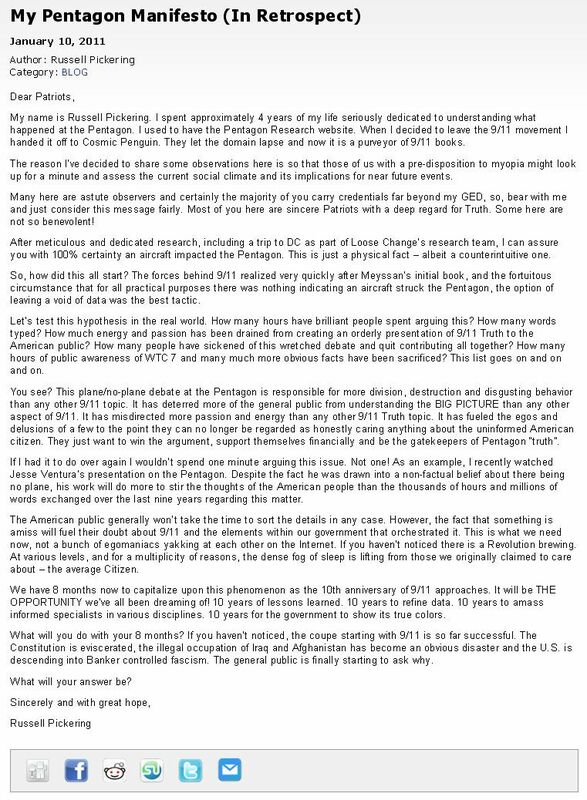 Pickering eventually removed his entire website with all of his "research" from the internet and, as already mentioned and sourced in the beginning of this essay, he quit 9/11 research all together. The only thing we are aware that he has published regarding 9/11 since then was titled "My Pentagon Manifesto (In Retrospect)" which was published in the beginning of 2011 at a variety of websites (archived here). If you search the title you may notice that in some places his name has been removed. It seems as though Russell has made an effort within the last few weeks to erase his name from the internet in an attempt to hide his significant history with the 9/11 truth movement. In light of this effort, this essay is meant to document for the historical record our experience dealing with his subversive behavior. As made clear in his "manifesto", Russell authoritatively states that be believes with "100% certainty an aircraft hit the Pentagon" and even goes so far as to call it a "physical fact". Of course he ignores the fact that we have continued our investigation and have provided an overwhelming amount of additional evidence validating our initial findings since he "quit" at the end of 2007. Since Russell has removed himself from the discussion we have had to deal with several other entities who claim to be part of the 9/11 truth movement but dedicate a significant amount of energy to fraudulently casting aspersions on our findings and our characters. Details regarding much of that and responses to their arguments are provided in a comprehensive essay that can be found here. We highly recommend that everyone who may have heard about these accusations takes the time to read that essay in full in order to get both sides of the argument. This will help you to understand the scope and context of the numerous attacks against us from those who have followed Russell Pickering's lead. "Arguably no single group is being targeted more toxically than the honest citizen detectives of CIT. That this disinformation campaign is being waged is a signal tribute to the historic importance of CITs work -- work that must be supported unflaggingly."